It’S 9:27 P.M., AND YOU’RE WATCHING TV. A fast-food commercial comes on and — WHAM! It hits you: An insidious, appalling and almost irresistible craving for a cheeseburger. This is not your average hunger pang. It is a command from an unseen force to rise from your chair, get in the car and find the nearest drive-through, or maybe just rummage through your pantry. What gives here? In some cases the urge to snack late at night is easily attributable to the power of advertising. But other times, it’s not so simple. You’re not hungry. So why the heck are you chowing down? Get to the bottom of that little mystery and you’ve got a good shot at getting down to your ideal weight. Not only is nocturnal munching the culprit behind many stubborn weight problems, it also has a nasty way of sabotaging one’s self-esteem. Late-night snacks tend to be hidden snacks, stolen morsels — the kind of stealth feasts that leave one steeped in shameful self-loathing and neurotic denial. “I’m just having a little bedtime snack,” we say to ourselves. But somehow, night after night one cookie or handful of snacks turns into two, and then the bag comes out. Before long, we’ve ingested more carbohydrates, saturated fats and refined sugars than we did during the course of the entire day. We end up feeling guilty, weak, embarrassed and out of control. We drift off to sleep berating ourselves for having caved into temptation once again and swearing that tomorrow will be different. The reasons behind late-night snacking are complex and various, so the first step toward overcoming a late-night snacking habit is figuring out your own late-night snacking profile. What do you tend to eat, when, where and why? Do you tend to eat more when you are alone, or with other people? Do you stop when you reach a certain level of satiety or sleepiness, or only when the food is gone (or worse, you’re nauseous)? Call your conscience out for an honest chat. Do a little journaling session, asking and answering these questions for yourself on paper. You might be surprised by how much you discover. Next, it’s time to reprogram yourself. Late-night snacking is in many ways akin to an addiction. It has both psychological and physiological components that can work together to make quitting a real battle of the wills between your conscious mind and your snacking alter ego. Once you’ve gone a few nights without snacking, you will probably feel yourself coming out of the forest, likely with some new pride and important insights in tow. Remember, you just have to get through one tough week, so be prepared and stand strong! SUGGESTIBILITY: If food ads make you hungry, don’t watch them. Can’t look away? You may do better watching videos instead of TV. BOREDOM/RESTLESSNESS/INSOMNIA: Is your mind or body going stir-crazy? Some people eat to shut off their active minds and/or give their hands something to do. Others end up watching TV to kill time, and then start eating because they are watching TV (see Suggestibility, above). The key here is to recognize that you are bored and restless and then make a conscious choice to do something else. Anything else. If you have trouble sleeping, try a tea with Kava or Valerian (both herbs relax you and help you doze off). LONELINESS: Being home alone (particularly during hours when you suspect that happy couples everywhere are cuddling up together) can predispose a solitary person to munch. If your body is lonely, it may call out for company in the form of a hot fudge sundae. Give it a warm bath instead. SELF-DENIAL: If all you let yourself eat during the day is protein shakes and carrot sticks (or you don’t eat enough, period) you are going to break down at night. Eat regular, well-balanced meals, and allow yourself the occasional daytime indulgence. If you are really hungry right before you go to bed, make yourself a small, healthy meal (like a cup of soup) instead of binging on empty calories. NUTRITIONAL IMBALANCE: If your body isn’t getting enough nutrition, it will send you hungry signals, no matter how much you eat. Also, eating too much sugar or carbs and not getting enough healthy fats during the day can set you up for a blood sugar crash that makes you hungry at night. GRIEF: Sad sometimes feels like empty. But eating will just bury your sadness, not relieve it. Instead, light a candle and make tea. Listen to sad music. Have a sob session if you want. Put warm towels on yourself. Rock. Ask a friend to come over and comfort you. FRUSTRATION: Anger and resentment can give you an upset stomach and make you want to eat to sooth it. Being angry or frustrated at yourself may make you “eat at” yourself as a form of punishment. Deal with the real issue instead. 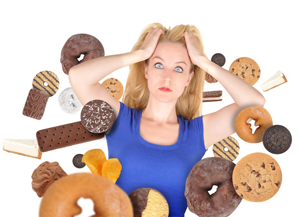 SELF-SABOTAGE: Weird as it sounds, you may be eating in order to keep yourself overweight. Subconsciously, we may be afraid of having the body we want — afraid of the attention that could come with having a super body, unsure of how it may alter our relationships with others or simply unsure we are ready to transition into a new form. If you suspect this might be the case, consider getting a few sessions of hypnosis, counseling or acupuncture (or any other type of treatment you find appealing) to help you get your whole system — conscious and subconscious — on board. PROCRASTINATION: If you don’t feel like studying or working, you may find yourself popping up from the task and going to the kitchen a lot. Ask yourself if there is a reason you are putting the task off. Maybe you need more info, maybe you just really don’t want to do it. If you have to do it anyway, try bungee-cording yourself to your chair. LACK OF OUTDOOR TIME: For some people, being in nature “feeds” a very important hunger. If they don’t spend enough time outdoors, they may compensate by eating more. If you suspect you might be one of these people, get outside every single day for at least an hour (getting into the habit of taking a 30-minute walk, morning and night, could totally change your life). SET A TIMER: Most cravings subside in under 10 minutes. If the bell goes off and you still have the craving, at least you tried! Next time, set it for 15. EXIT STRATEGY: Get out of the house. Go to a bookstore, a coffee shop (for tea) or better yet, go to the gym! SELF-TALK: Go to the mirror and talk to yourself out loud about what you plan to eat and why, why you’d rather not, what you might do instead, etc. MUSIC: Filling your house with music at night may keep you feeling more active, less like vegging out and eating. Making music will keep your hands busy. CLEANING: Whether you wash the floor, clean out the closet, iron shirts or sort socks, there’s something therapeutic about doing housework late at night. Plus you wake up to a clean place! SELF-CARE: Instead of doing something that trashes your body, do something to treat it: Give yourself a sea-salt body polish, mud mask or pedicure. BOOKISHNESS: Whether you read histories, novels or self-help books, you’ll be enriching yourself, keeping your hands occupied and your cravings at bay. AROMATHERAPY: Research shows that burning aromatic candles or incense can turn your appetite off (but avoid chocolate and vanilla aromas). Keep a sachet of lavender under your pillow and sniff at will. DENTAL HYGIENE: Brush your teeth and floss directly after dinner and again before you go to bed. You’ll be less likely to get up and eat. WATER: Sometimes your body will send you food cravings when it is really thirsty. Need more flavor? Try hot water with lemon, ginger, a little real maple syrup and a dash of cayenne pepper. It’s warming, cleansing and stimulating enough to your taste buds to kill a lot of cravings. PRODUCTIVITY: Learn a new skill, paint, knit, take up an instrument, surf the Web, plan your next vacation. When you have more fun, interesting things to do, you’ll have far less reason and opportunity to munch. HEALTHY EATING: If you really are hungry, and if you’ve been active during the day, a nutritious pre-bed snack may be a good thing! Have a little protein to help muscles rebuild; just go easy on fats, refined carbs and sugars.